Spirit Unleashed—nominated for the 2015 Pulitzer Prize in non-fiction! 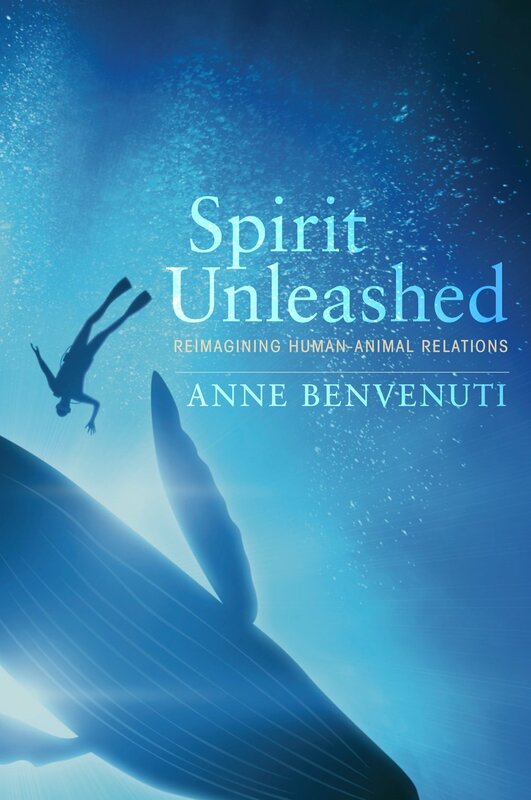 Spirit Unleashed: Reimagining Human-Animal Relations is available now! And I'm excited to be working on my next book, Kindred Spirits: details soon. "Spirit Unleashed is a most important book for showing how misleading it is to believe and to live as if there is a great divide between us and other beings. When we pay close attention to what we know about the cognitive, emotional, and moral lives of other animals and when we listen to what they want and need from us. . . it is easy to choose to live in close, respectful, and peaceful coexistence with them. Rewilding our hearts is a natural path for achieving a broad natural spirituality in which all beings will benefit from sharing our magnificent planet. Anne Benvenuti poignantly shows how true this is." My work is about human-animal relations. Rapid and far reaching changes in human-animal relations are creating what I call the greatest story on Earth. Yes, we humans are coming home to a family that we didn't know we had, or perhaps had forgotten. This is what I'm writing about: that we're finally rejecting the idea that we're superior, and we're understanding that we're kin. Learning to see other animals not as objects in our world but as subjects in their own is compelling—and yes, challenging! What is it like to be an elephant? Or a baby cheetah? We have to do the science, and we have to listen! I've created a new Facebook group about this, and I'm inviting you to join it! You can read about this beautiful young whale—whom I encountered in the wilds of Mexico's Magdalena Bay—in chapter 5 of Spirit Unleashed. "There, I was a whale's toy, but never a thing tossed about, always a being whose needs were being taken into account. The whale recognized that I was an animal who was interested in her, as she was interested in me. I might mention that this is a good enough description of a soul-encounter for my purposes. When was the last time someone recognized your interest in her and returned that by being interested in you?" My blog speaks to the ideas and stories in the book that I'm writing now, Kindred Spirits. Come with me on the journey! It was a February dawn in South Africa in 2008, and I was about to fulfill a dream to ride on an elephant through the African dawn. After a thorough orientation to the elephants here at Camp Jabulani, the time came to ride them out into the bush veldt. I climbed up a platform ramp, received instruction on using the stirrup and keeping my weight balanced, I swung a leg over Jabulani’s broad back. Isaac Mathole, one of the men who had accompanied the elephants from Zimbabwe, was already on Jabulani when I landed. I was startled by how rudely I landed, but Jabulani didn’t flinch and Isaac just laughed. Paul adjusted my stirrups, and then Jabulani walked off with me bouncing along on his back, absolutely gobsmacked (me, that is!). Isaac and I chatted over his shoulder. He told me that he loved his life of working with the elephants, and asked me if we have any wild animals in California, where I’m from. Sure, of course, I said, mountain lions, bobcats, coyotes, foxes, rattlesnakes. The waters of San Ignacio lagoon were calm and we were calm when we returned to them after our lunch on a sunny deserted island to head back to camp. But our well-fed somnambulance was soon disturbed. “A whale! 3 o’clock, 3 o’clock,” someone cried, as for the first time a gigantic adult swam up alongside us about ten feet from the boat, her blow holes and mottled skin visible. It had taken me a while to learn the visuals of gray whale anatomy, partly because they do not have fins on their backs, but a series of knuckles, visible vertebrae which, in addition to blow holes, tell you which side is up. Their nostrils sit undaintily on the tops of their heads, ridged exposures that allow you to navigate visually forward and down to the huge jaws that open into baleen lined mouths, the baleen shorter and more bristly than I expected, looking and feeling like a cross between teeth and several layers of old tattered shower curtain. Jason is the name I gave to a young raven whom I presumed to be male, based upon the crowd of bachelor buddies he hung out with, and Jason was the king of the water bowl under the pine tree in my front garden. I had often watched Jason take flight from a branch in his pine tree, moving his wings to gain elevation until he became that wide V shape that is the hieroglyph for a soaring bird, way up in the distant thin sky. Like all ravens, he was able to powerfully perform the mechanical kind of flight that uses the pumping of his own muscles and blood; but, like eagles and hawks, he was also able to catch drafts and to soar. I’d seen him catch a draft and ride it, sometimes tumbling upside down mid-flight, or drop spiraling down and then pulling up in an impossible lift. I ever return to the question of whether we can know anything about what it is like to be another kind of creature. And so, while perusing the carefully researched and oddly entertaining new book, Does it Fart?, I learned that we do not know with certainty whether or not spiders pass gas. Theoretically, they do have the digestive capacity, but no one has done the research. We do know, however, that they bite. Little did I know when I wrote my last post that I had just been bitten by a ragno violino, the Mediterranean version of the brown recluse spider. Sure, I'd felt the pinch, and had taken off my shirt and shaken it out. It just didn't seem big deal in the context of a summer in which I've been morning and evening meal for a host of insects, mosquitoes fierce and relentless at the top of the list, ticks next—and yes, I do wear protective clothing with repellent oils. It’s been almost two months since I promised to start writing about bugs. It’s not that I haven’t been spending time with them; I have! The problem is that in my new life as an organic farmer, I don’t have time to write during May and June, and other months as well. . . because I’ve got weeds that grow shoulder high in one field during the time it takes to clear another field. This reality causes me to recall with some longing the use of herbicides: how easy, how convenient. But I’ve left that behind, along with many other easy and convenient things. The fact that I am out weeding manually almost every day instead of spraying poison means I am also spending time with bugs. It even means I begin to notice a relationship between the weeds and the bugs and me, though I do not yet understand what I notice. This morning I stepped barefoot across the stone floor, moving out of the bedroom to greet the new day, and what did my wandering feet behold? A small pile of grit in the doorway, grit that wasn't there when I went to bed. I looked up to see a new hole in my star-vault stone ceiling, a hole made by ants chomping through the stones. I didn't actually see any ants this morning, but I saw them last summer, marching across the ceiling and chewing the stone, and far too frequently falling into bed with me! No one told me about this when I expressed my romantic fantasy of living in an old European stone farmhouse. And this morning I wonder why there is a "yuck factor" to ants falling into my bed that I don't feel when my three little dogs burrow between the sheets! Adding some wonderful photos by my friend Bill Kauffman, taken at Farm Sanctuary!